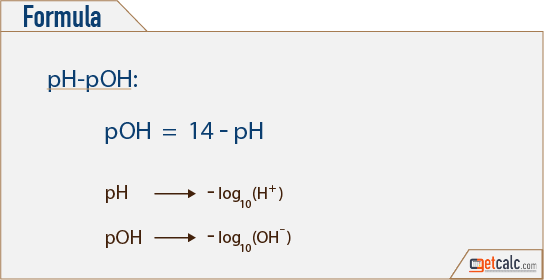 getcalc.com's pH - pOH Calculator is an online chemical engineering tool to perform the conversion between hydrogen (acidity & alkalinity (H+)) and hydroxide (OH-) ion concentration of the solution, in both US customary & metric (SI) units. pH & pOH, often denoted by an alphabet H+ & OH- respectively, is the measure of hydrogen & hydroxide ion concentration of the solution. pH is an important factor in chemical process, represents the acid & alkalin level of a solution. Whereas, pOH values are derived from pH values to represent hydroxide ion concentration of the solution.